BMW has officially revealed its plans of reentering Le Mans endurance racing after exiting the racing discipline in 2011. 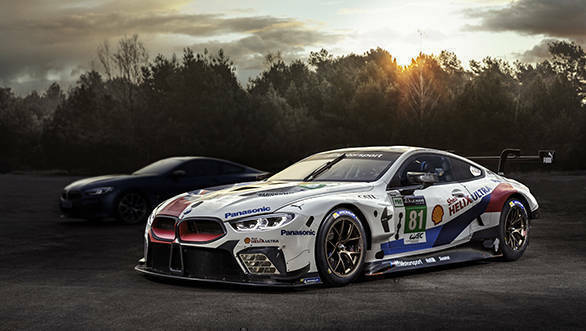 Their reentry will come courtesy of the BMW 850 GTE Racecar (pictured in racing livery). On the occasion, BMW will also reveal its road-going counterpart - the BMW 8 Series coupé - which was developed alongside the racecar. In fact, BMW has teased the 8 Series coupé sans any camouflage, lurking in the shadows behind the 850 GTE racecar. It is likely to be the M850i xDrive variant, that is expected to be powered by a twin-turbo V8 that feeds over 530PS of power and 750Nm of turning force to an all-wheel-drive system, via an eight speed automatic transmission. Expect 20-inch wheels, an adaptive M suspension and an electronic lockable rear differential too. The BMW 8 Series coupé is set to replace the 6 Series coupé line and in the process, it revives the 8 Series model nomenclature that BMW discontinued in 1999. Apart from the hot M850i xDrive teased here, BMW will also spawn milder variants of the 8 Series coupé, a full-blown M8, and hopefully an 8 Series convertible too.